however, having said that, my shop is almost done (after a year full time) and i have permission from the wifey to do other projects once i start on the house. and i really want to do this. those re-drives are the answer until somebody develops a better rotax 185 ( for a reasonable price ). so, if i can get some interest, i'll go ahead with it, but give me a couple weeks. i'll up date my contact info so we can get going on this thing. ps if you need a price, the props were 500 bucks for the pair from what i remember, and the quote for the redrive was 500 each 1000 per plane. there was some wriggle room based on the amount ordered...... still interested? I will be willing to pony up money for 4 redrive units. Just describe the basic setup (if its the style like the picture shannon posted - the typical BC redrive) and method for belt tightening. perhaps with a few minds on the matter we could improve things a little bit before you freeze the design. also, bearing location and type, thrust bearing, method of bearing retention etc etc. if a bearing spins loose, don't want the prop pulling ahead of us in flight! redrives aren't simple things to cluge together. it takes a lot of finesse to make a nice light, strong, simple redrive. you have the pulley's, but you're going to have to re-engineer the way the large pulley attaches to the shaft, and the way the shaft attaches to the nacelle. thats a big job. i have pulleys and a block at home to play with, but if mike wants to do the legwork for a redrive, i am behind him 100%. i'm at work right now but will get on it friday. basically its a copy of the BC redrive. but more modern. its also built by a guy who has extensive experiance building paraglider motors so i am trusting his designs. will the parts be CNCd or sand casted? is there anyway to have the option of putting teeth on the small pulley to facilitate an electric starter? I know i can probably buy a separate ring gear and put it all on after, but if its possible to include in the design it might be cool. lightweight starter motors are more plentiful now than 20 years ago, and electric start is really nice with the EC lazair. the parts are cnc'd. its a copy of the "bc redrive" as far as ratio and the basic idea goes but the frame attaches to the front of the crankcase using the same mount face as the water pump so its a better mount and it uses a sepintine (sp?) belt. hopefully on thursday i'll be able to get some photos of the prototype. as far as mounting a ring gear......i'll ask about but part of the low price is we're using some spare pulleys that were excess. that may be a major mod. what about adding a ring gear to the back of the engine? where the recoil mounts on. just a thought. the price (if i remember correctly ) was for each unit, two per plane, and was for the whole thing, belt and all. prop was extra, of course. 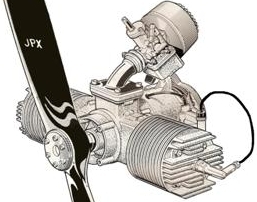 the bolt pattern on the prop hub was a standard dimension so any prop maker could fit it. further to the prop thing. the guys who made my props had the original prop pattern from the original "bc redrive" so it was a lot cheaper as they didn't have to program the cnc machine. the props are really nice. i'll send a couple pics of those as well and hopefully they are still in business. just talked to my machinist. i'm sticking my neck out and am getting 12 units built. thats one set for my plane and 5 others. they won't cost more than 500 a unit (1000 a plane). probably less but he'll have a definite price soon. the belt tension is adjusted with an eccentric on the prop shaft that can be twisted. all the parts will be cnc'd. the reduction ratio is 1:87 to 1. if the mighty 185 turns out 5000 rpm we'll get approx 2600 at the prop. i didn't really look at how the prop shaft stays on but he's been running these bearings and setups on paragliders for years with no problems. i'll grant you that his is in a pusher configuration but we'll be running half the hp so i don't fore see any problems. any how if the prop does come off its the same problem no matter what system. the small pulley will be machined to fit the rotax tapered shaft. he has one of my engines to use. the prop will hang below the engine as with the bc drive. it uses a 1" serpentine belt that he'll figure out the length. the mounting frame will mesh with the old mount on the face of the crankcase like the original water pump. the prop bolts will have a standard pattern. so..... like i said i'm sticking my neck out and going with it. if you do the math, its a reasonable gamble on my part. i could have the most expensive set of redrives on any lazair anywhere. i'm not offering any claims or whatever, these are of course experimental etc etc. all i know for sure is that they are a copy of an existing design that is proven to really improve the performance of the lazair. i have no numbers to show a comparison except personal experience. i was out flying with my redrive equipped buddies and they were on floats and i'm on wheels and they were out climbing me 2 to 1. i couldn't keep up. i thought there was something wrong with my plane. ohhhh thats a lot of typing. i'll have a time line for them being ready and keep everyone informed. will the prop shaft mount from the face or from below like this pic of the super lazair?